Young in years, but rich in experience: becoming famous is certainly possible, even if not among a listening audience that above all is searching for choice simplicity. It goes without saying that a musician with an innate pun as a name (and the last name betrays the country of birth) would also give his band a name with a twinkle in his eye: Young Rich & Famous. When a CD is then also titled "Grand Grace", then you can assume that the music is full of creativity, spontaneity, wisdom and even courage. As Christophe Schweizer (trans. note: name translates as "Swiss") explains in his liner notes, you cannot say in advance how listeners will find the music and what it will trigger in them. With improvising musicians, you can't even say in advance how they will interpret and adorn the compositions. You know that even less when flowing transitions from written down and improvised passages are aimed for as with Grand Grace, which are then barely discernible when you listen to them. 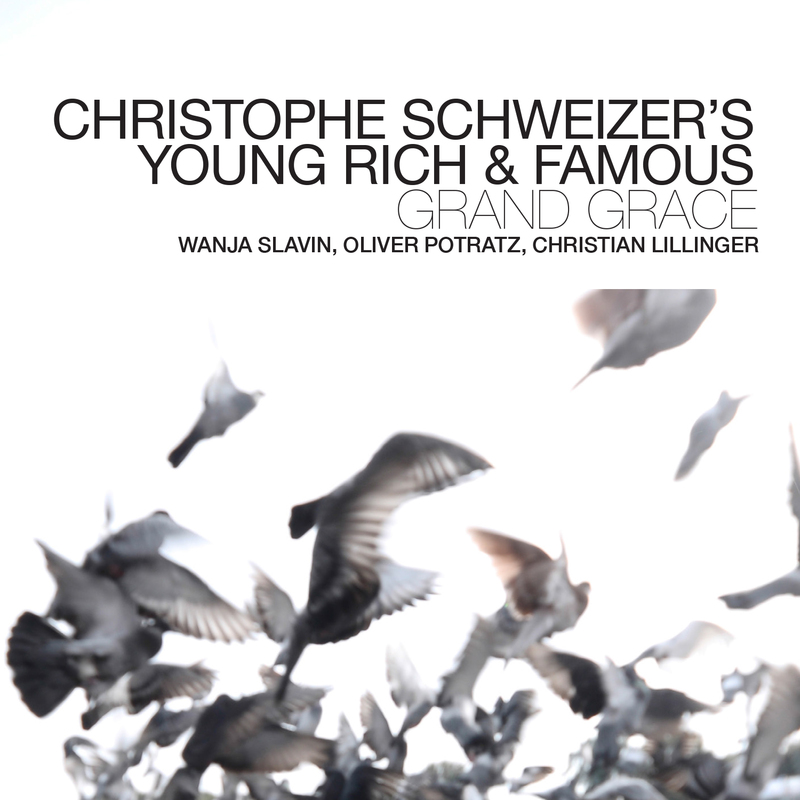 Schweizer is that much happier that the interpretations by Wanja Slavin, Oliver Potratz and Christian Lillinger “are much more beautiful than everything that I wished for beforehand." Compositions, which develop an almost hypnotic stimulus due to their structure, are made even more intensive thanks to the improvisations and radiate their own magic. This quartet was formed to present a gift of music to every listener with a free spirit and unprejudiced auditory canals. Christophe Schweizer, born in Bern in 1968, lives in Hamburg today. He attended both the jazz school and the conservatory in his place of birth for a short time, but he soon was drawn to the motherland of jazz where he studied in New York and Banff until he finally moved to New York for longer in 1996. He started his own bands such as "Normal Garden", "5SIX","QuadrantX" and "Moonsun". He worked extensively in various big bands at the same time, from the "George Gruntz Concert Jazz Band" and "Mingus Big Band" all the way to "Jazz Bigband Graz". The musicians involved in Schweizer's projects include David Binney, Dan Weiss, Billy Hart, Donny McCaslin, Alex Sipiagin, Ethan Iverson, Claudio Puntin, Stéphane Galland, Sebastian Gille and Guillaume Perret, among others. Today, Schweizer works increasingly as composer, arranger and conductor for larger ensembles and as interpreter of contemporary/experimental classical music. He is going to produce a project dealing with the music of the legendary drummer Billy Hart (who is also his mentor) and the WDR Big Band in 2015, and he founded the JazzHausEnsemble Hamburg, which collaborated with Gary Thomas, among others, in 2014. Wanja Slavin, born in Freiburg and resident of Berlin by choice for 10 years, has no longer been considered a newcomer at the latest since receiving a distinction with the Jazz Echo Award 2014. He has developed an unbelievably unlimited virtuosity especially on alto saxophone, but also has mastered clarinet, flute and piano. However, he does not show off his talent, but instead integrates it into his ideas of music. Oliver Potratz is a bassist much in demand. This is certainly also due to his impressive versatility. Originally playing violin and e-bass, he has concentrated mainly on contrabass since his studies in Berlin. He plays alongside Gebhard Ullmann in "Bass X3", Kalle Kalima (with whose band Klima Kalima he received the New German Jazz Prize) and has also accompanied the jazz diva Gitte Haenning. This cosmopolitanism gives the CD its deep foundation in the literal sense of the word. Christian Lillinger is Christian Lillinger. The student of Günter "Baby" Sommer has also been in a category of his own: someone who goes his own way, rubs people the wrong way and challenges. However, the German world of drumming would be a lot poorer without him. He caused a sensation with his band "Hyperactive Kid" and has played in the trio of Rolf Kühn for years. His list of people, alongside of whom he has played, is impressive. He fits into this quartet like a perfect puzzle piece. ""Grand Grace shines because of avoidance of repetition. (...) A self-supporting, slightly melancholical sound-picture that has no difficulty with the ease out of harmony and courage." ""Grand Grace is for an audience that is interested in music on the interface of improvisation and composition.""